We spent Monday night through Saturday night on the road giving flu shots to two of the missions in Chile--Rancagua which is just south of Santiago and Vina Del Mar which is north. It was a very full and very fun week. We drove to both areas and found our way around quite well. The following is an except from my journal for the week. 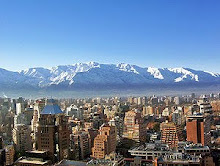 The trip to Rancagua was nice but we did go too far and had to backtrack a little. We stayed the night with the Wengreens who are a senior office couple. They are just wonderful and we had a most delightful time with them. I particularly enjoyed Sis. Wengreen. She has a wonderfully positive attitude and is doing amazingly well with her Spanish for only being in Chile for 5 months. He is the office secretary and she is the historian but they also do support for a branch, do proselytizing and teach seminary on Saturday morning. and worked north. Here is a photo of the great reception we received as we came to give the shots. It was fun! The photo above is of Sis. Resek with some sister missionaries. As soon as she got there, one of the sisters came up and ask if there was some way Sis. Resek could get her peanut butter. Sis. Resek reached in her bag and pulled out a jar of peanut better. She had been prompted that morning to put the jar in her bag. We finished and got back to Rancagua in the later afternoon. In the evening we drove to Pres. and Hna. Resek’s beautiful home to give them shots and had homemade pizza with them. I had forgotten to bring the flu vaccines so Elder Wengreen ran back to get them while we ate pizza and waited for Pres. Resek who had done 80 interviews that day and didn’t finish until almost 9 pm. The Reseks are from Argentina and have four boys—all living with them. I think the boys are about 8-16 and they are delightful young men. What a great family. Here the Reseks are on the left and the Wengreens on the right with another Resek boy. They have four boys. We left the next morning at 8am and had four places to go north of Rancagua up in the suburbs of Santiago. These were all closer together so it went pretty fast. All in all we gave 165 shots. It is so fun to be with the missionaries. I get rejuvenated every time by their enthusiasm. We had a little time to get things somewhat settled for the next morning and then went to bed early. Dave was still feeling pretty sick. Thursday morning we left again about 9 am for Viña del Mar after calling Paul and having a nice visit with him for his birthday. We took the loop into Valparaiso. On the way we had untold telephone calls. We couldn’t keep up with them and we were lost in Valpo and going the wrong way on a one-way street. We finally had to stop taking the calls. When we got to Viña, the phone was dead. It had charged all night but we had used it so much in the morning, it was dead and needed charging in the church. Valparaiso is built on seven hills and the homes go straight up the hill and are painted in very bright colors over their corrugated metal walls and roofs. It is very famous for its distinct personality. Parley P. Pratt and his wife traveled to Chile in 1851 and dedicated Chile for the preaching of the gospel. While there, they had a son who died and there is a memorial to that baby in the cemetery. All non-Catholics were buried in the Cemetary for Dissidents as seen here. That is where we found the plaque for the Pratt baby. Viña del Mar is a beautiful city on the ocean with beautiful parks and buildings. It is a relatively new city. It had been land granted early by Spain to Spanish elite and finally in the 1800’s, after poor management, they started selling it off in parcels. It gradually became a city. We instantly liked President and Sis. Gillespie. They are wonderful. We got there at the end of their zone conference. Dave saw patients and I gave about 70 shots. It only took a little over an hour. Then Pres. and Hna. Gillespie took us to their beautiful home and served us a wonderful almuerzo with an avocado salad that was to die for and chicken cordon bleu. We had such a nice visit. Then they took us on a good tour of Valparaiso—up and down the very steep hills filled with brightly colored homes as well as a stunning view of the ocean. It was just perfect. At the Gillespie's, we stayed in what they call the 'general authority suite'—a building behind the Gillespie home that has two small apartments which are used for guests. It is very comfortable. We had a relaxing evening studying and reading. We needed that so it was great. However, we got a phone call just after 2 am from a senior sister missionary in Santiago. Her companion had gotten up in the night for a drink and the bathroom and passed out cold and hit her head. She couldn’t stay conscious. We directed them to get her to the hospital and that was difficult for them. For some reason, they couldn’t get an ambulance. Their guard at the apartment even tried to help. Finally they had to wake up the couple where the wife is the nurse who helps us in the clinic. With three of them, they were able to get her out to a taxi. She couldn’t really walk. We were pretty worried about her. Friday morning Dave was still feeling pretty rough. We talked with the sisters at the hospital and found that all the tests were negative. The sister was very drowsy, dizzy and nauseated but they felt that this must all be from the concussion so they decided to send her home from the ER mid-morning. We didn’t have to be to the next conference in the Viña del Mar Mission until 1 pm so we took our time. We also went on a nice walk down to the seashore and walked along the walkway there. There were large black rocks that looked a lot like slate, piled high to make a sea wall. Many had been written on—mostly scriptures from the Bible. We were stopping to read many of them and not paying a lot of attention. Suddenly we saw a wall of water rising up over the seawall toward us. We turned and ran toward the street but the wave got us and pretty much soaked our back sides and my backpack. We got a good laugh out of that. We again gave shots after the conference and Dave saw missionaries. Then we left for a place called Los Vilos, another coastal city which is up the coast about 2 hours or so. It was a beautiful drive and we arrived without much difficulty at the wonderful chapel there. It is just a branch but it has a most beautiful, new building with tile work on the lower walls and floors and a most lovely chapel. Here we gave about 8 shots or so and Dave talked with several missionaries and then we left and headed north again to Coquimbo, a blue collar town right on the sea, just a few miles from the resort town of La Serena. We arrived at the cute little home of the Sextons about 10 pm. The drive had been nice but we were aware that we had passed beautiful scenery along the sea and it had been too dark to enjoy it. The Sextons are another just wonderful couple. They are converts from Texas. She was an RLDS member and it took her a long time to decide to join the church. Her husband had joined years before her. They are so full of excitement for the work and are doing a great job of activation in the area. She also teaches piano. We slept the night at their home and the next morning took them to the little church with us for the immunizations of their 14 missionaries including them. They got us on our way to La Serena but we were already late when we left. We found La Serena without much difficulty and gave another 12 shots or so and Dave visited with missionaries about health problems. From there we left for Ovalle but got lost going out of town and lost a lot of time. We were about an hour late for Ovalle. It has another wonderful church for their branch and I was so impressed with what appeared to be great organization. There were sign- up sheets on the bulletin board for feeding the missionaries, talent night, and a RS activity of baking or something. They also had posters up with the photos of all the Deacons, all the Teachers and all the Priests in the ward. Pretty impressive! Everywhere we went, we had great visits with the missionaries and that is so fun. They have so much energy and enthusiasm about them. From there we started home. At first we saw all types of agriculture. We passed beautiful fields, many of which looked like they had just recently been planted to cold weather crops like cabbage and lettuce. Then we got into vineyards and orchards. There was an orchard of some type of fruit tree that we passed for 5-7 minutes going about 65 miles an hour and it did not stop. It also went to our right for as far as we could see. I cannot comprehend an orchard that size. It had to be 7 miles or more long. There was no longer fruit on the trees so we could not tell what kind of fruit they were. Some of the drive from Ovalle was not so pretty for quite awhile. It looks a lot like driving through Wyoming or Nevada and parts of Utah. It is a big-time desert with many cacti and other desert plants. There were many fences of cacti as seen here. Some of the large cacti are just starting to bloom in large red flowers, however. The soil is a light colored, coarse sand and there were very few people. The homes were very modest—small, square, cement or wood homes with mostly corrugated metal roofs. We think that the main industry through there is mining and goats. We saw many signs for goat cheese. There were no towns for a long time. Finally the highway turned and headed back to the coast just as the sun was getting ready to set. We saw the most stunning sea scapes with the sunset on the horizon and large black rocks jutting up in the crashing, foamy waves. It reminded me a lot of Hawaii. .
We have covered a lot of territory in the last two weeks. By the time we finish in Osorno in three weeks, we will have covered an area from about Ohio to LA. So far we do not have plans to go to the most northern part of the country—Antofagasta. Traveling from the top of the Antofagasta Mission to the bottom-most tip of the Osorno mission is the distance from Boston to LA. Do you know you can add photos to your posts too?